This recipe by Yasmin Khan takes inspiration from Tehran and is a refreshingly different way to enjoy your favourite green veg. Place the Tenderstem® on a baking tray and toss with 2 tbsp of the olive oil and ¼ tsp of the salt. Roast for about 20 minutes until the Tenderstem® are tender but still have some bite. Meanwhile, whisk together the yoghurt, garlic, herbs, remaining olive oil, remaining salt and a generous grind of black pepper. When the Tenderstem® is ready, transfer to a serving dish and leave to cool to room temperature. 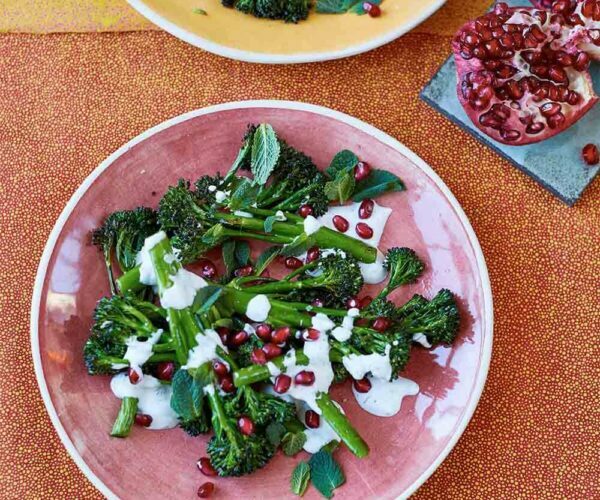 Drizzle the yoghurt sauce over the Tenderstem® just before serving and finish with a scattering of pomegranate seeds.